World of 2-XL: Mego 2-XL Program "General Information (Revised)"
Other Comments: For those who are new to 2-XL, General Information was the program that 2-XL came with. There are actually two completely different versions of this program, both of which look exactly the same from the outside. The only way to tell the difference is to listen to them. This is the revised 2-program version, and it's much harder to find, since it was only distributed during 2-XL's final year of 1981 (although it's possible that it may have started shipping as early as 1980). For a brief time, this cartridge was also sold by itself without 2-XL-- as Mego went out of business, they started clearancing a lot of 2-XL tapes to Kay-Bee, simply shrink wrapped and not packaged on cards, and this tape was included with them. The "Revised" version covers most of the same ground as the original version, but being a later tape it has a lot of the later standards to it: For starters, it's now split into two programs, one with the booklet and one without. (And of course the "with booklet" version features lots of that good old KPM library music!) And like a lot of the later tapes, Dr. Freeman was now in the groove with 2-XL's voice and personality, so he's much more relaxed and less stiff than the original version. A lot of the same questions are still re-used here; the first question is still about the worlds fatest man, you still get a choice of the same sports questions, a choice of Star Trek questions, etc. (Although a fun Trek nitpicker note here: 2-XL says the questions are about the TV show, "not the movie!" which is amusing enough since there had only been one Trek movie at the time. But a question has been changed to "What deck is the captain's quarters on," and it uses the answer from the movie!) And the More Information button is still used for the actual clip of Neil Armstrong's words as he decends the ladder of the Apollo 11 Eagle to step foot on the moon. But there's lots of new stuff added here too: most notably, a great interview with Benjamin Franklin. 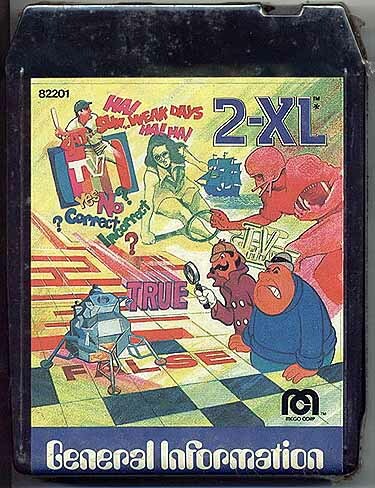 There's also some new jokes (so the punchline on the tape's label finally makes sense) and, best of all, 2-XL gives us his theme song! * A NOTE ABOUT PRINTING THE BOOKLET: This booklet was made in pdf format, courtesy of Brandon. Thanks, Brandon! The advantage to this is you can now download the entire booklet at one time, manipulate it for printing however you want using Adobe Acrobat, and the text looks incredibly clear. (To download this, right click on the link and select "Save Target As.") The only disadvantage is if you have a computer that can't use Adobe Acrobat. For those people, I plan on adding my standard jpg version later. A NOTE ABOUT MUSIC: Music titles without quotes and with composer names are the actual titles of the music. All other music titles (given in quotes) have been arbitrarily chosen by Frank and myself, since we don't know the real titles yet. These titles were picked based on many different things: the program we first heard the song on, or the project we first used it in, or whatever imagery it made us think of the most. 15 second wav samples (approximately 325k each) have been included for your convenience to be used as a reference. The running times listed in the description above are NOT the sample length. They are the length of the song as it is used on the 2-XL tape pictured.